The watercolor, A Young Hare (1502), is one of the most famous examples of Dürer’s study of nature and animals. 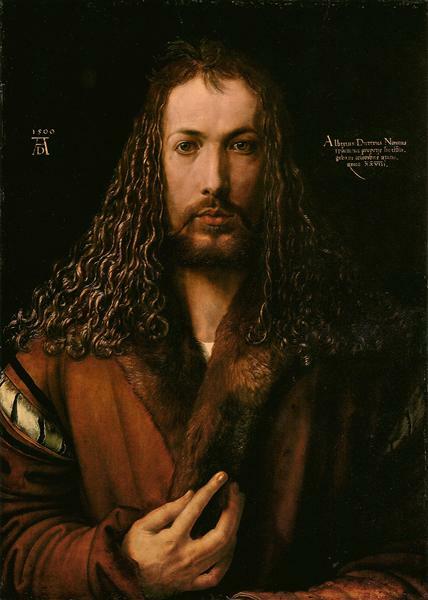 The artwork is significant, not only because it demonstrates Dürer’s supreme craftsmanship, but also because it provides insight into Dürer’s understanding of the relationship between art and nature. The Renaissance brought about the development of new techniques of representation, such as the study of proportions, perspective and imitation of nature. 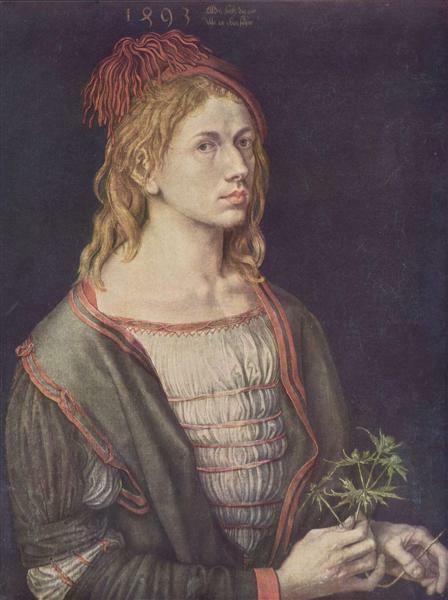 When visiting Italy in the late 1490s, Dürer got acquainted with many of these techniques and brought over the newly acquired knowledge back to Germany. For this reason, much of Dürer’s artwork from the early 1500s, including A Young Hare, expressed his interest in nature. The artist understood the importance of observing nature, stating: “Depart not from Nature… for Art is rooted in Nature, and whoever can pull it out, has it”. The quote shows Dürer’s position on the relation between art and nature, and how studying and emulating nature is crucial to artistic creation. Another central principal in Dürer’s perception of nature was diversity, meaning that every specimen and detail in nature has a distinctive character that should be captured. In other words, Dürer’s intention was not to create an archetypical form or rely purely on the general characteristics of an animal or plant. Dürer conceived the hare with exceptional virtuosity, paying attention to the minutest details, such as the hare’s whiskers and eyes. The artist captures its shy and fragile nature, showing great empathy and affection for the small animal. 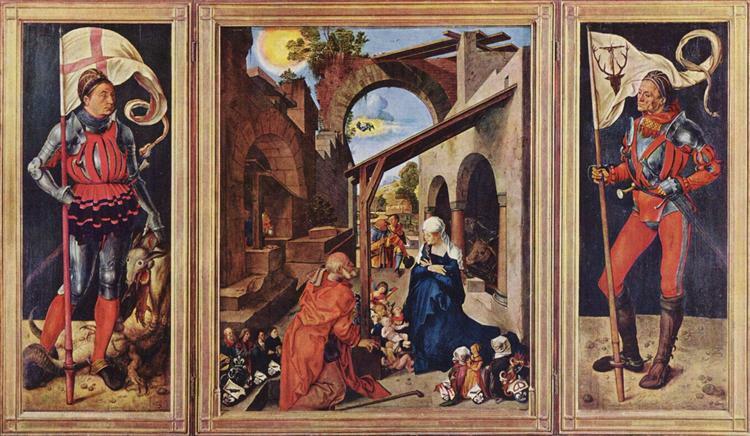 The method by which Dürer managed to reach this level of accuracy is a point of discussion. At this period, methods of animal stuffing were not yet existent, hence Dürer did not have an option of copying a stuffed model. Likely, Dürer created preparatory sketches of the animal in the wild, and relied on his memory to complete the watercolor. It is also possible that the artist studied a dead animal or caught a live animal and kept it in his workshop. In this case, the subject of the hare is presented in a non religious and non symbolic context. 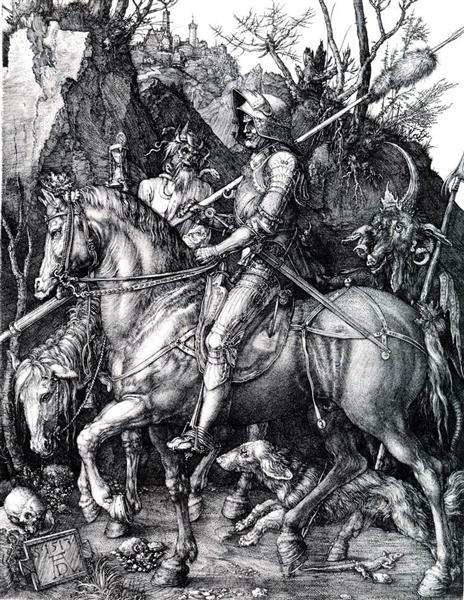 This aligns with Dürer’s perception of nature and his pure interest in studying nature (animals, landscapes and plants). An interesting aspect of the watercolor is the background. Dürer chose to present the hare in a white space rather than its natural habitat, like a forest or meadow. The neutral background was used by Dürer repeatedly, in artworks such as Head of a Stag (ca. 1503), The Little Owl (1506) and Wing of a Blue Roller (1512). 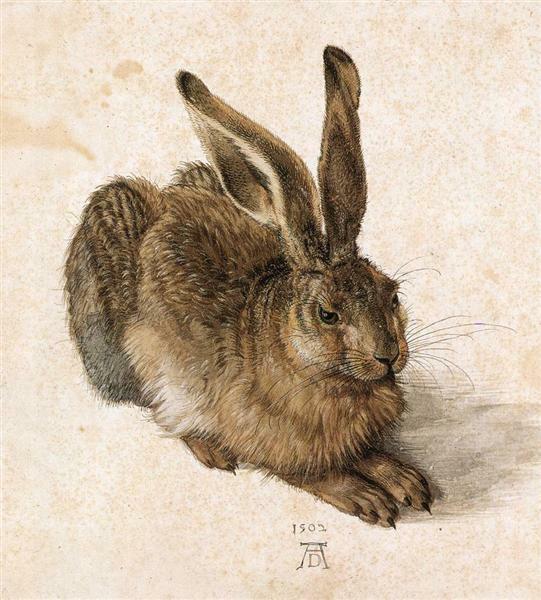 In the case of A Young Hare, some point out Dürer paints a reflection of a window in the hare’s eye, suggesting that the animal was drawn in the artist’s studio. 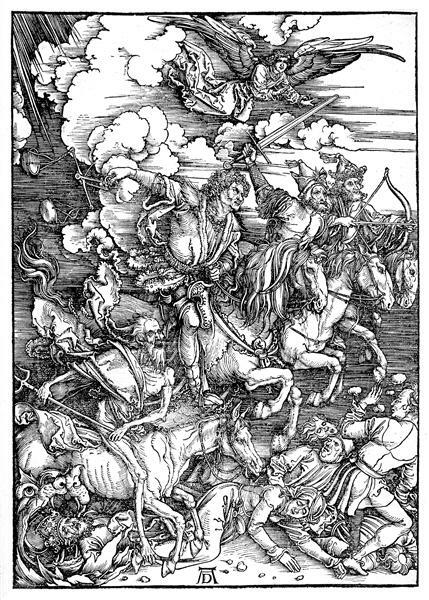 Nevertheless, this is speculative because this technique was commonly used by Dürer. Many of Dürer’s successors and students copied the drawing, however they always placed the animal in a natural environment, such as a meadow or a forest. An example of this is A Hare in the Forest (ca. 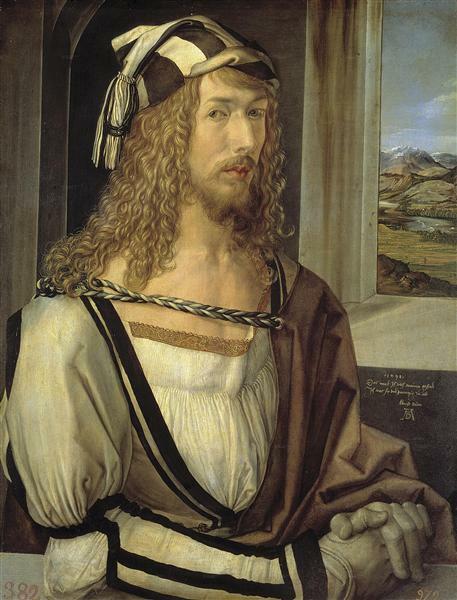 1585) by Hans Hoffmann, who based this oil painting on Dürer’s watercolor. Young Hare (German: Feldhase) is a 1502 watercolour and bodycolour painting by German artist Albrecht Dürer. Painted in 1502 in his workshop; it is acknowledged as a masterpiece of observational art alongside his Great Piece of Turf from the following year. The subject is rendered with almost photographic accuracy, and although the piece is normally given the title Young Hare, the portrait is sufficiently detailed for the hare to be identified as a mature specimen — the German title translates as "Field Hare" and the work is often referred to in English as the Hare or Wild Hare. Dürer lightly sketched the image and underpainted it with some washes of brown watercolour. Then he patiently built up the texture of the fur with a variety of dark and light brushstrokes in both watercolour and bodycolour. Gradually, the painting was brought to completion with the addition of a few refined details such as the whiskers and the meticulous reflection of a window in the creature's eye. There is some debate over how Dürer accurately captured the image of the hare: he may have sketched a hare in the wild and filled in the individual details from a dead animal, or captured one and held it alive in his studio while he worked on the painting. A reflection of the window frame in the hare's eye is often cited as evidence for the theory that Dürer copied the hare from life in his workshop, but this cross-barred reflection is a technique that Dürer frequently used to add vitality to the eyes of his subjects. Dürer used his watercolour and bodycolour studies as source material for his prints, but in The Holy Family with Three Hares the hares are modestly rendered, and in the only of his other prints to feature a hare, the 1504 copperplate engraving Adam and Eve, the hare is turning away, half-hidden behind the legs of Eve. The prominent date and Dürer monogram on the Young Hare indicate that Dürer considered it a work in its own right rather than merely a preparatory sketch. The painting engendered numerous copies: at least twelve from contemporaries are known.